quality emergency services through the efforts of its dedicated personnel. The annual Awards Banquet was held Saturday, March 9, 2019 at the Beach Club. Beginning on March 11, 2019, the Bob Everest Station 1400, located at 2525 NW Highway 101, Lincoln City will be closed for seismic improvements and station remodeling. The seismic improvements are made possible by an Oregon Infrastructural Authority Grant. The station remodeling was approved by District voters in 2018. 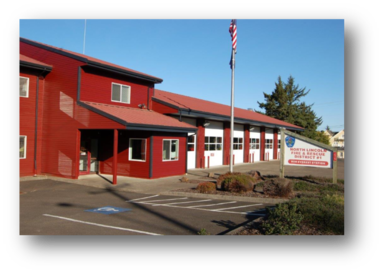 While the station is closed, all Administrative Offices will be located at the St. Clair Station 1600, located at 4520 SE Highway 101, Lincoln City. At the board meeting held on February 13, 2019, the Board appointed Division Chief Rob Dahlman to the position of Interim Fire Chief. and will begin as the District's Fire Chief effective March 1, 2019. The Central Oregon Coast Training Officer’s Association (COCTOA) Fire Academy concluded nearly six months of training with a graduation ceremony held at North Lincoln Fire and Rescue’s St. Clair Station & Training Facility on February 28th. More than a hundred friends and family members attended the event to celebrate the achievements of their loved ones. In a long-standing fire service tradition, as each recruit moved forward to receive their certificate, his/her badge was pinned on by one of the proud onlookers. Division Chief Jamie Mason presented Recruit Firefighter Peter Pimentel of Toledo Fire Department with the Top Recruit Award. This award is voted on by his peers in the Academy. The recruits received Oregon State certifications for Firefighter I, Hazardous Materials Operations, and Wildland Firefighting. In addition, students had the opportunity to gain real time experience responding with instructors on a student engine based out of the St. Clair Station. This training program brought the fire departments and fire districts under one format, promoting consistent response to emergencies in Lincoln County. The time these recruits spent together did more than create trained firefighters, it built friendships and relationships between agencies county-wide. The fourteen recruits represented five agencies: Depoe Bay Fire, Central Coast Fire, Newport Fire, North Lincoln Fire, and Toledo Fire. They will be joining the ranks of their respective districts or departments on March 1, 2019. 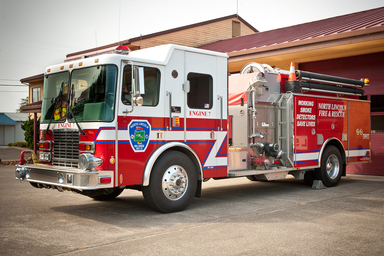 If you are interested in becoming a volunteer firefighter, please contact Division Chief Mason (NLFR) at 541-996-2233 or your local fire agency. The next county-wide COCTOA Fire Academy is planned for the fall of 2019. Peter Pimentel (Toledo Fire) received the Top Recruit Award from Division Chief Jamie Mason. Firefighters, friends, and family gathered at North Lincoln Fire & Rescue’s St. Clair Station on February 28th to bid Fire Chief Doug Kerr farewell and wish him well on his retirement after 35 years of volunteer and career service to the District. Lincoln City Police Chief Jerry Palmer presented Kerr with a LCPD Chief award and commented on how over the years, the Police Department and the Fire District have worked together with great cooperation and respect for each other’s roles on emergency scenes. Firefighter Bob Duby shared some comments about Kerr saying; “You know one thing about Doug (Kerr), after every call he’d go around and thank all the crew for coming out and helping”. Chief Kerr spoke a few words of gratitude to all the volunteers and staff and concluded with his trademark “Thanks for all you do”! Long-time friend and North Lincoln Fire Board Member Alan Lee presented Chief Kerr with a shadow box containing the badges and insignias he has worn over the past 35 years. Lincoln City Police Chief Jerry Palmer presenting Chief Kerr with the LCPD Chief Award. Effective 10/26/2018, the outdoor burn ban has been lifted in Lincoln County. You must have a valid burn permit and abide by the outdoor burning regulations. This is for yard debris only using a burn barrel or up to a 3' x 2' burn pile. WITHIN THE CITY LIMITS OF LINCOLN CITY. In the early morning on Saturday, October 20th, a dozen members from the American Red Cross drove to the Otis Fire Station from Salem and Portland to team up with local Red Cross organizer Mitchell Hamrick, and several North Lincoln Fire and Rescue Support Team members for smoke alarm installation training. More than 60 smoke alarms were installed in the Otis and Lincoln City. The national American Red Cross program “Sound the Alarm” the Home Fire Campaign helps save lives by installing free smoke alarms in homes. In addition to the smoke alarm installation, information is provided regarding creating a fire escape plan for the family. A hazard checklist is also provided and reviewed with the resident. Every day, seven people die in home fires, most in homes that lack working smoke alarms. Sadly, children and the elderly disproportionately lose their lives. The American Red Cross wants to improve the odds and save lives. That’s why they launched their Home Fire Campaign in 2014. A critical part of the “Sound the Alarm” campaign is a series of home fire safety and smoke alarm installation events across the country. Red Cross volunteers, along with fire departments and other partners, canvass at-risk neighborhoods, installing free smoke alarms, replacing batteries in existing alarms, and providing fire prevention and safety education. In just three years, Red Cross has accomplished so much, including the installation of more than 1 million smoke alarms and prepared more than 1 million people against home fires through their home visits. Thanks to all who came to learn and install the smoke alarms. We plan on doing this event again in the late spring of 2019! In addition to smoke alarms, a couple of Support Team members equipped 16 homes with house number signs in Otis as part of the “If we can’t find you, we can’t help you” campaign. If you want to be part of the campaign, give a call! Together we CAN save lives. The Fire Academy had its first classroom session on October 2, 2018. The class comprised of 30 students embarking on a 5-month plan of training. This training prepares them for emergency response not only in our local communities but statewide through the conflagration system if they so choose. Classes are held on Tuesday and Thursday evenings with three selected Saturdays throughout the five-month period. Classes begin at 1830 hours and end at 2130 hours. Everyone is welcome to attend the classes and meet the new Recruits. Thank you, voters, for approving Measure 21-183.
bathrooms, adding a secondary means of egress, and repairing the kitchen and living areas. The 2016 Awards Banquet was held on March 10, 2018 at Chinook Winds Casino Ballroom.